This is another backdated post from my trip to Langkawi. I was in Langkawi during the Chap Goh Meh weekend for a work-related workshop. Having arrived via flight, colleagues of mine insisted on going to Kuah town for one very important reason...SHOPPING! 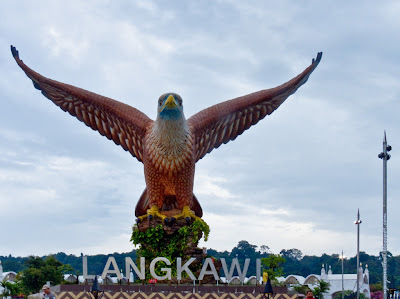 Well not quite the only reason, for I also wanted to see the Dataran Lang (Langkawi Eagle Square) and the jetty complex since it was my first visit to Langkawi. The eagle at Dataran Lang. This statue depicts a Brahminy Kite (Haliastur indus intermedius) in a rather aggressive posture perched on a rock. On their shopping list were chocolates, chocolates, and more chocolates...plus some bags to carry all the chocolates and other stuff back home. So off we go to Kuah town. We were lucky for the fact that one of my colleagues can be considered a 'hard-core' Kuah town shopper, thus we had no problems with getting around Kuah. 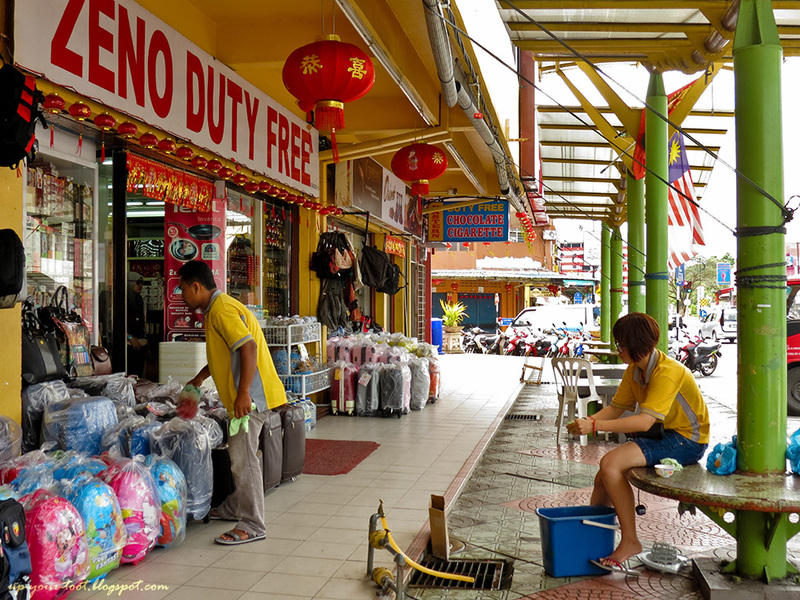 An assortment of duty free shops are abound around Kuah town and also at the Jetty Complex. You sort of see the shops over and over again, especially more popular names like Haji Ismail Group, Zeno etc. However, one is advised to check and compare prices, for some items might not be as cheap as it appears to be. One area that we went not once, but twice was the Jalan Pandak Mayah area in Kuah town. 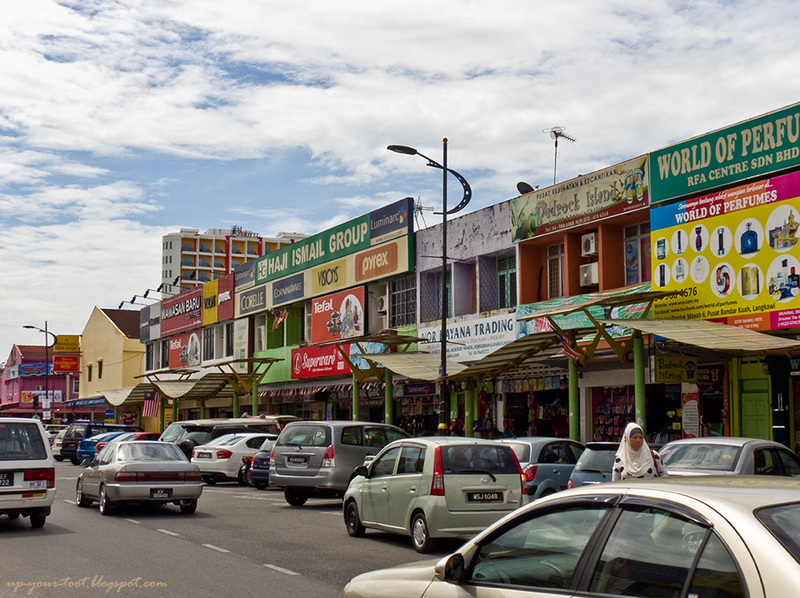 There were rows of shophouses with shops like Haji Ismail Group, World of Perfume, Zeno etc. that beckon you to come in and part with your money. Suffice to say, our entourage left the area with the car boot full of stuff, which is not surprising as we have two housewives in our group. And oh, someone even bought a set of Corelle dinnerware. Around Kuah town...duty free shopping is a curse for shopaholics and aunties (read housewives). Shoppers beware, if you don't have cash, most shops accept credit card. Worst still, you can use your bankcard (ATM card) in some of the shops. Rows and rows of bags in front of a duty-free shop. A lot of people end up buying bags just to accommodate their purchases in Langkawi. Nearer to the Kuah Jetty Complex is another shopping area called Langkawi Fair Shopping Mall. However, there were not that many people around the mall and the atmosphere just wasn't right for shopping. We left without buying anything, but the shopaholics in our group did manage to complete a price-compare mission. Of course one cannot forget the Jetty Point Duty Free Complex that is adjoining to the jetty building. Numerous shops within the complex caters to the last minute shoppers clambering to buy more stuff before leaving the island. There were also cafes and fast food eateries over here if your tummy growls at you after all the shopping done. Whilst the rest were shopping, I was busy taking shots of the Dataran Lang and the surrounding panorama. At that time, the weather was not ideal to say the least, thus shots turned out rather crappy and dull due to the overcast sky. To sum it up, Kuah is just a place for you to buy, buy and buy, and take photos of man-made attractions such as the Dataran Lang and the Taman Lagenda (Legenda Park - Legend on a Park).